Is reason and thinking opposed to God? 2.1 Jesus wants us to think! 3 How does faith start? 4 How does one lose faith? 5.1 How are we supposed to think? 10.1 Doesn’t the Bible Say True Faith is Blind? 11 Adding to the Bible? So don’t try to use your own intellectuals, use your heart. Now remember, you don’t never try to reason; we cast down reasoning. In the garden of Eden, the devil took a man’s head to work through; God took a man’s heart. And the man’s always working to what he can see, and faith makes him believe things he cannot see. But he believes it because God said so. That settles it. That’s just the—the story of faith. We demolish arguments and every high-minded thing that is raised up against the knowledge of God, taking every thought captive to obey Christ. How do you destroy or demolish arguments? With better arguments and reasoning... that's exactly what Paul did with the Jews in the synagogues that he visited. That's how you know God is by faith, NOT BY REASON. Your reason power within yourself, but faith comes from God. Faith is something that's born in you, something that God gives you. "And it's the substance of things hoped for, and the evidence of things not REASONED." Hallelujah. William Branham changes scripture (again) to suit his anti-intellectual bias. But what Paul actually said is that “we live by faith, not by sight.” Paul never says, “We walk by faith, not by reason.” Paul never says, “We walk by faith, not by thinking,” because faith and reason, faith and thinking are not opposed to each other. Faith and sight are opposed to each other, because faith is being controlled by the truth. 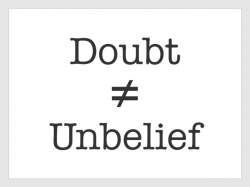 Anytime someone asks for rational support for a belief, they are accused of being a "doubting thomas" and liken their own blind faith as the model that Jesus says was "blessed." But note that Thomas was not satisfied to have trust or faith even in the first hand, eye-witness accounts of his peers, he wanted EMPIRICAL evidence, to SEE with his eyes, to FEEL with his hands. This is the very epitome of the Natural Scientism worldview, if it can't be observed, handled, tested, etc, then it isn't believable. Yet Paul says we walk by faith, not by sight. Every single believer who has lived on the Earth who has put his faith in the objective, historical reality of Jesus' death and resurrection and the recorded witness of that event qualifies under Jesus statement: "blessed are those who have not seen and yet have believed." Again, Jesus did NOT say: "blessed are those who have not THOUGHT and yet believed." Paul reasoned in the synagogues and persuaded men to be Christians. What did William Branham think of this? First realm is your senses of see, taste, feel, smell, and hear. That's in your outer body. On the inner body, which is the spirit, is reasonings and thought, and so forth. We must cast all that down. Please note that no such scripture exists in Proverbs. We tear down arguments and every arrogant obstacle that is raised up against the knowledge of God, and we take every thought captive to make it obey Christ. The Bible clearly does not say to "cast down reasoning". Come now, and let us reason together, saith the Lord : though your sins be as scarlet, they shall be as white as snow; though they be red like crimson, they shall be as wool. Jesus wants us to think! There are many other times where Jesus asked people to think. Why? He was challenging them to think about what He was saying so that they could come to faith! Faith always starts with information. You hear the Word and then you start thinking about it. How do you develop your faith? You develop your faith through thinking, through reasoning it out, through getting the evidence. How do you develop faith in a doctor? How do you develop enough faith in somebody to marry them? What do you say? There are people who have done that. It’s a sad thing, and that’s not a joke. The fact is, everybody knows you do need faith in order to marry somebody, and the stupidest thing in the world is to try to build your faith by closing your mind to the facts. The smart thing is to develop your faith, and that’s the natural way to develop your faith, by thinking. How do you decide whether you’re going to have minor surgery? You get up enough faith, and you do this. Why do you think Paul says we walk by faith, not by sight? He means as you walk by what you know, you stick with what the truth is, and you tell your moods and your feelings and your fears where to get off. That’s faith. We walk by faith, not by sight. We go on what we know, not by what we see, not on what the appearances are, not on what the feeling is, not on how it feels at this moment. We walk by faith. We know. You react. You don’t think. When you become a Christian, you say, “Wait a minute now. I have a standard of truth here by which I can judge anything and everything. I cannot just go along.” God does not say, “Check your brains at the door.” Faith starts with thinking. How does one lose faith? In order to get faith enough to have an operation, to have faith in the doctor and in the procedure, you study it. But say on Saturday morning, if you wake up and you say, “Oh my. I agreed to have this surgery, but now I just can’t.” You call in sick, or you say, “I can’t do it,” or you postpone it or something like that. You’ve lost your faith. Well, how did you lose your faith? Did you get new information that shows you it wasn’t a good idea? If instead you say, “Wait a minute. If I don’t do it now, this is going to happen later. I’ve studied all this.” Then you will have the operation. Faith starts by thinking, and when you lose your faith, it’s because you stopped thinking. Is faith the opposite of reason and thinking? Absolutely not. You lose faith because you stop thinking, because you stop reasoning, because you stop looking at the evidence and you listen to your emotions and you listen to your fears. It’s actually silly to think faith is the opposite of reason. Look at Matthew 6 where Jesus says, “If you’re worried, have no anxiety, but think about the lilies of the field. God takes care of them. Think. Have no anxiety, but think about the birds of the air. God takes care of them.” He says, “O ye of little faith? If God takes care of the birds and the grass, and you’re more valuable than they, won’t he take care of you?" What is Jesus doing? He says, “O ye of little faith? You’re not thinking.” He doesn’t say, “If you want to have faith, stop thinking, and just believe.” That’s not faith. That’s not what the Bible calls faith. David Martyn Lloyd-Jones says that Jesus Christ insists that the whole trouble with people of little faith is that they do not think. They don’t gird up the loins of their minds. They allow circumstances to bludgeon them. Think about this. They allow their feelings to collar them. The Bible is full of reasoning. We must never think of faith as something purely mystical. Faith progresses through thinking, Jesus tells us. Not only that, the Bible tells you that you can’t grow in holiness unless you’re willing to let God take over your thinking. It says in Ephesians 4:22–24 to be renewed through the renewal of your mind. That’s the place where it says, “…put off your old self… put on the new…” and be renewed in the renewal of your mind. Christianity is the only thing that encourages thinking and gives a basis for it. There are only three basic worldviews you can have right now today. There have been other worldviews, but there are only three basic philosophies of life out there. You have scientific materialism, which says there is no soul, there is no supernatural, there is no God, and there is no heaven and hell. Therefore, everything is an accident, and everything has a natural cause. These people will tell you, ultimately, that means your mind is an accident, and the thoughts you’re having right now are just the chance reaction of molecules under your skull. They’re just bouncing off of each other. You believe what you believe strictly because of biological and chemical determinants. Therefore, on the basis of that, there is really no reason for you to trust your thinking. There is no reason for you to reason. Everything is relative. The postmodern deconstructionists say, “Because all values are socially constructed there is no right and wrong. The purpose of life is not to try to find out what truth is and what justice is and conform to it. Absolutely not! You do whatever the heck you want,” which means there is no search for truth. There is no reason to reason. There is no reason to think. It’s all a power struggle. “Whoever has the power, whoever comes out on top is the one who rules. We don’t find out what is right. We don’t find out what is wrong. There is no right and wrong.” Don’t you see that scientific materialism leads to the death of thinking? “You don’t need to think. You can’t trust your thinking.” That’s the first basic philosophy you have. The second basic philosophy is Eastern monism (Eastern pantheism and Eastern religions). They believe, and anyone will tell you this who understands the New Age and understands the Eastern religions, what is wrong with us is that we think, that we’re rational, that we reason. Eastern meditation is after what they call pure awareness without thought. Eastern meditation says what you need to see is that it’s all one. “You’re one with the tree. You’re one with nature.” There is no individuality. Eastern thought tries to frustrate the reason and tries to frustrate your analysis. It says, “Eventually we’re all going to go back into the All Soul, and there won’t be individualism. There won’t be individuals. There won’t be personality. There won’t be rationality. We’ll all be one.” Eastern religion gives you no basis for rationality, but Christianity, or I should say the religion of the Bible (Judaism and Christianity and even Islam, which is based very much on the Bible) teaches there was a God who created the world who was rational. “If there is a God who is rational, my reason is not an accident of molecules, and my reason is not an illusion. My reason is a reflection of his person. It means if a rational and orderly God created the world, then when I use my reason I’m going to find out what is really out there.” But philosophically, at the end of the twentieth century, Christianity is the only thing in the world tonight that really encourages you to use your mind. Do you know why? Look at all the people who really understood the truth and said, “The Bible is the truth.” That’s freedom. Do you know why? No matter what your friends tell you, no matter what your political party tells you, no matter what the ideology tells you, no matter what the dictator or the king who is ready to cut your head off tells you, you know what the truth is. If you have the Bible, if you know there is an absolute truth, you could be the only person in the whole world, it could be you against the entire world, and you can know you’re right. Look at Elijah standing before Ahab. Look at Moses standing before Pharaoh. Look at Paul standing before Herod Agrippa. Look at Polycarp in AD 88, the old man standing in the coliseum. They were about to throw him to the lions, and he said, “Away with you all!” He dies. Look at Latimer and Ridley being burned at the stake. Look at Martin Luther standing before the whole world. These were free thinkers because they knew and because they had submitted to the truth. Now they had a standard by which they could judge any ideology. They had a standard by which they could judge any philosophy. They weren’t the victims of their culture anymore. They weren’t the victims of their party. They were always able to judge their own culture and their own party and their own philosophy and their own school. Christianity is the only basis for being a free thinker. It’s the only basis and encouragement for actually using your mind. Well, all the religious leaders thought that proved he couldn’t be a great teacher. “Look, the common people like you! The common people are following you.” Of course, all through the early church, they were all the common people. They were the slaves. They were the illiterates. And what happened? Their minds woke up. The gospel always arouses the thinking. Throughout the history of the church, throughout the history of the world, whenever the gospel has spread amongst people, their minds wake up and they want schools. The gospel always makes you gird up your mind, and do you know why? Because the gospel is not a teaching. The gospel is not a philosophy that says, “Here, live in this way. Just live in this way.” That doesn’t make you think. The gospel says, “God has broken into the world in the form of Jesus Christ, and Jesus Christ is the Son of God. He died for us, and he was raised from the dead.” Don’t you see? You can’t even listen to that teaching without it electrifying the mind. It challenges the mind. It shocks the mind. There are only two kinds of people reading this. The first kind are the people who think Christianity is something maybe that might help them privately spiritually, but they really are afraid to actually let it challenge their minds. If Jesus is who he says he is, you must belong to him wholly: intellectually, emotionally, and volitionally. If he is the Son of God as he said, if he rose from the dead as was claimed, you have to look at that evidence. You can’t just say, “Well, I don’t know what I think about all of this. I want to just have a kind of personal, mystical experience. I just want to have peace.” You can’t do it. God says, “I will not come into your life unless I come in through your mind. You have to receive the form of teaching. You have to look at the evidence. You have to believe it. You have to check it out.” Don’t you dare try to do it and run around the mind. Listen to the gospel. Let it argue with you. Lastly, some of you are Christians, but you’re not very consistent Christians because, really, so many people come out of fundamentalism or come out of liberalism or out of all these different churches, and they all really do bypass the mind. Don’t you dare. You need to study the Word of God. You have to let the Word of God sink in. You have to let your mind be completely bathed in the authority of God. How are we supposed to think? This view of Christian belief is common among skeptics and believers alike. Critics think Christians accept truth claims without any evidential support and many Christians embrace the claims of Christianity unaware of the strong evidence supporting our worldview. Dawkins is correct when he argues against forming beliefs without evidence. People who accept truth claims without any examination or need for evidence are prone to believing myths and making bad decisions. Followers of William Branham should do likewise and closely examine the evidence that is available surrounding his ministry. The Bible uses the word “unreasoning” in a pejorative manner; to be unreasoning is to act like a brute animal. God clearly wants more from beings created in His image. In fact, God wants us to examine all the evidence at our disposal and to study the things of God with great intensity. When we do this, we truly begin to worship Him with our mind. This kind of faith is unafraid of challenges. In fact, Christians are encouraged to examine what they believe critically so they can be fully convinced. Let each man be fully convinced in his own mind. Critical examination requires us to investigate the evidence, and God holds evidence in high regard. He wants us to be convinced after we examine the facts. Jesus valued evidence and continually provided evidence to make his case. Jesus continued to provide evidence to the disciples, even after the Resurrection. …until the day when He was taken up, after He had by the Holy Spirit given orders to the apostles whom He had chosen. To these He also presented Himself alive, after His suffering, by many convincing proofs, appearing to them over a period of forty days, and speaking of the things concerning the kingdom of God. The earliest Christians understood the connection between reason, evidence and faith, and they did not see these concepts as mutually exclusive. In fact, Paul often used direct evidence to make his case for Christianity. And according to Paul’s custom, he went to them, and for three Sabbaths reasoned with them from the Scriptures, explaining and giving evidence that the Christ had to suffer and rise again from the dead. When believers use their minds, investigate the evidence and become convinced, something wonderful happens: We have the courage to defend what we believe using the same evidence, logic and reasoning power we used to come to faith in the first place. In fact, we are required to do this. Christians in all disciplines of inquiry and discovery have used their reasoning power to investigate the evidence. Christians are not irrational, and Christian faith is not blind. The rich intellectual history of Christianity calls each of us to have a reasonable, examined, evidential, case-making faith. This kind of faith honors God and withstands skeptical criticism and personal doubt. This is true. If you were going to trial, the last thing you would want a jury to do would be to adopt a position blindly. But many people seem to think that Christians do this very thing, when they adopt the view that Christianity is true. This is largely due to the fact that the term, “faith” is largely misunderstood. For some (even for some Christians), faith is best defined as “believing in something that lacks supporting evidence.” But this is not the definition of faith that is presented on the pages of Christian Scripture. The Biblical notion of faith is more akin to “trusting in the best inference from the evidence.” The Biblical authors repeatedly encouraged their readers to search the evidence to investigate the claims of Christianity (see 1 Thessalonians 5:19-21 and 1 John 4:1) so they could be convinced of the truth of these claims (Romans 14:5, 2 Timothy 1:8-12 and 2 Timothy 3:14). If you believe in something IN SPITE of the evidence, you are holding to an unreasonable faith - where we refuse to accept or acknowledge evidence that exists, is easily accessible and clearly refutes what we believe. Believing in something BECAUSE of the evidence. We hold a reasonable faith when we believe in something because it is the most reasonable conclusion from the evidence that exists. The Bible repeatedly makes evidential claims. It offers eyewitness accounts of historical events that can be verified archeologically, prophetically and even scientifically. Doesn’t the Bible Say True Faith is Blind? The Biblical definition of faith is a reasoned trust in light of the evidence. Jesus told us to trust his claims in light of the miracles that confirmed his words evidentially (John 14:11), and he spent 40 days with the disciples after the resurrection, providing them with many convincing proofs that he was alive (Acts 1:2-3). There are several passages in scripture that, at face value, seem to be saying that faith is blind. For example, Hebrews 11 starts by saying that “faith is the substance of things hoped for, the evidence of things not seen.” This seems to be saying that faith is made out of hopes, and that having faith is evidence enough. It appears to be the closest Biblical statement affirming a “blind faith” that is not restricted to things that can be supported by evidence. No, he’s saying just the opposite. When considering chapter 10 prior to interpreting verse 11:1, it’s clear that the author is encouraging his readers to endure those times when God seems absent; those times when trials and tribulations cause us to question God’s existence. Where is God in these difficult situations? Why can’t we see Him? Why can’t we see His activity in our lives? In verse 11:1, the author of Hebrews says that we can trust that God’s salvation, protection and provision are still there for us, even though they may appear to be “things not seen.” In spite of their apparent absence, we are told to trust that they exist. Why? On what basis? On the basis of what we can see. Over and over again the Old Testament saints, when questioning God’s goodness, provision or protection, were encouraged by a leader or prophet to remember what God did for them in Egypt. God’s rescue efforts in Egypt were provided as a piece of evidence, demonstrating that He was capable of rescuing His children again. God has given us visible assurance that he exists, and the writer of Hebrews is simply asking us to trust this assurance when God and his mercies seem like they are “things not seen”. Even the writer of Hebrews understood the conviction and assurance that resulted from evidence: the evidence of God’s Old Testament activities and the evidence of Jesus’ New Testament miracles. That's the reason you can't rise up in faith, because you got intellectuals there. Your intellectual part says, "Well, this, or that." It's a reasoning. We want to cast down reasonings, the Bible tells us. But now, as long as you dwell in that mental reasonings, you'll never be no different. Now, the Bible said we've got to cast down reasoning. The Bible said, "We cast down reasons." The Bible, in Proverbs, says, "We must cast down reasonings. ↑ John Nelson Darby, The Holy Scriptures: A New Translation from the Original Languages (Oak Harbor: Logos Research Systems, 1996), 2 Co 10:4–5. ↑ The Holy Bible: King James Version, Electronic Edition of the 1900 Authorized Version. (Bellingham, WA: Logos Research Systems, Inc., 2009), 2 Co 10:5. ↑ New American Standard Bible: 1995 Update (LaHabra, CA: The Lockman Foundation, 1995), 2 Co 10:5. ↑ Biblical Studies Press, The NET Bible First Edition; Bible. English. NET Bible. ; The NET Bible (Biblical Studies Press, 2006), 2 Cor 10:4–5. ↑ The Holy Bible: English Standard Version (Wheaton: Standard Bible Society, 2001), 1 Cor 14:20. ↑ The Holy Bible: English Standard Version (Wheaton: Standard Bible Society, 2001), Php 3:15. ↑ The Holy Bible: English Standard Version (Wheaton: Standard Bible Society, 2001), Mt 18:12. ↑ The Holy Bible: English Standard Version (Wheaton: Standard Bible Society, 2001), Lk 10:36. ↑ The Holy Bible: English Standard Version (Wheaton: Standard Bible Society, 2001), Ac 17:17. ↑ The Holy Bible: English Standard Version (Wheaton: Standard Bible Society, 2001), Ac 19:8–10. ↑ New American Standard Bible: 1995 Update (LaHabra, CA: The Lockman Foundation, 1995), Romans 10:17. ↑ The Holy Bible: English Standard Version (Wheaton: Standard Bible Society, 2001), 2 Cor 10:5. ↑ http://coldcasechristianity.com/2012/doesnt-the-bible-say-true-faith-is-blind/ Doesn’t the Bible Say True Faith is Blind? This page was last edited on 9 January 2018, at 23:02.